Benfica was the first club to challenge Real Madrid for European supremacy. Real Madrid has dominated the competition until 1961 when Benfica defeated Real Madrid’s rivals, Barcelona, in the European Cup final in Berne. A year later and Benfica was back in the final this time against Real Madrid. Real Madrid had won the first five editions of the tournament, and Benfica had broken that cycle with a win in 1961. This was a chance for Real Madrid to get back in the winning column and for Benfica to set them as a force in European football. The stage was set for a final of epic proportions. 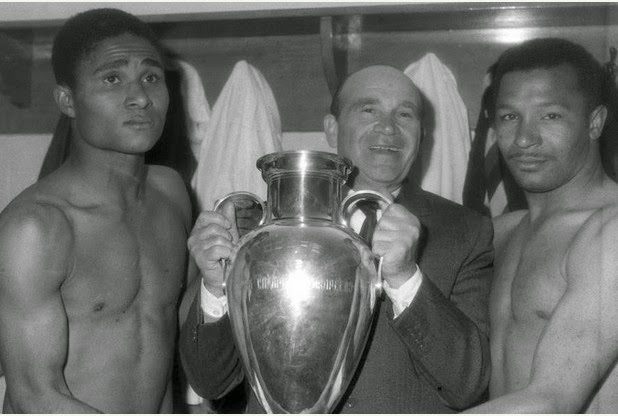 The summer of 1962 saw Benfica sign the 19 year old Eusebio and he would immediately make an impact on the starting eleven. The path to the final wasn’t easy; they had to defeat the English double winners Tottenham Hotspur in a frenetic semi-final. This was one of the most anticipated finals in the recent history of the competition. The only two teams that had won the tournament would be meeting in the 7th edition of the tournament. Adding to the mix you had a Real Madrid with players like Puskas and Di Stefano going against Eusebio and Coluna from Benfica. You had two colossal teams featuring some if not the best players in the world at that moment. If goals were the main reason to watch this game, then the viewer’s got their money’s worth in a 8 goal thriller. Benfica came back from 2-0 and then 3-2 to win the cup 5-3 in one of the most iconic and spectacular games of all time. Benfica was losing 3-2 at halftime and the Hungarian coach Bela Guttmann made a change at halftime that perhaps is the single reason why Benfica won the match. He assigned Cavem to mark Di Stefano. This allowed Benfica to stop the ball from reaching Puskas that had scored a hat trick in the first half of the game. Coluna scored the 3-3 with an incredible long range shot from around 30 meters, and after that it was the Eusebio show. Eusebio would put Benfica ahead from the penalty spot after a dazzling run that saw him tackled in the box by Pachin. A few minutes later Eusebio would score his second of the game giving Benfica the 5-3 lead which would end up being the final result. It would be Benfica’s second win in two years and the last win by the Portuguese giants.